Ginger, the rhizomes of Zingiber officinale Roscoe (Zingiberaceae), as one of the most popular spices, has been recorded through the ancient times of China and cultivated for thousands of years for medicinal uses in China . Phytochemical investigation of ginger revealed that Z. officinale possess volatile and nonvolatile pungent principles. Among them, the biologically active alkyl phenolics are present in plants of the Zingiberaceae family. Modern pharmacological studies showed that ginger has anti-inflammatory , antioxidant , antimicrobial , anticancer , anxiolytic, and antiemetic activities . However, the chemical constituents and pharmacological activities from the aerial parts of Z. officinale Roscoe are rarely studied. 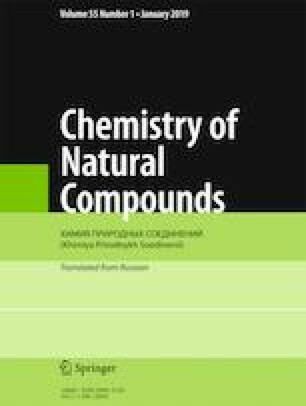 In this paper, seven compounds were isolated and identified from the aerial part of Z. officinale, and all the compounds were isolated from Zingiberaceae for the first time. Published in Khimiya Prirodnykh Soedinenii, No. 2, March–April, 2019, pp. 291–292. This research was supported by the Shanghai Municipal Committee of Science and Technology in China (Nos. 14431900300, 15431900400) and the Development Project of Shanghai Peak Disciplines-Integrative Medicine in China (No. 20150407).